Individual batteries and individual cells within lead acid batteries react differently to be charged. Over time battery performance will drop as differences become more pronounced. At this stage it is necessary to perform an equalization charge (or refreshing charge) – usually once every 10 cycles, at least once per month, or when the range of voltages across the battery bank‘s batteries is over 0.30 volts. nb. 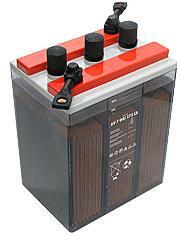 An equalization charge must only be performed on vented (not sealed) wet lead acid batteries. An equalization charge is a current-limited charge carried out at higher voltages than normal in order to bring all cells within all batteries to 100% charge. A typical lead acid battery charger uses a fixed charging voltage of 13.6 volts in day to day operation. During equalization this charging voltage is increased to 14.4 volts and higher ensuring that all cells receive the current necessary to get them fully charged. Those cells which are already at 100% charge are overcharged and therefore vent gas as the electrolyte boils. The voltage of the battery can increase to as much as 16+ volts during equalization and so it is important to disconnect any voltage sensitive equipment from the battery before beginning to prevent damage occuring. Equalization is the best way to increase the longevity and efficiency of lead acid batteries, but great care has to be taken to ensure that the batteries are not overcharged for too long.